Could the U.S. Have Prevented the Chemical Weapons Attack in Damascus? We intercepted communications involving a senior official intimately familiar with the offensive who confirmed that chemical weapons were used by the regime on August 21 and was concerned with the U.N. inspectors obtaining evidence. On the afternoon of August 21, we have intelligence that Syrian chemical weapons personnel were directed to cease operations. 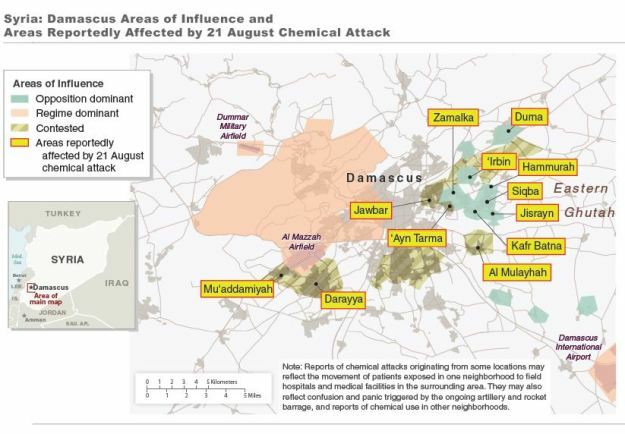 At the same time, the regime intensified the artillery barrage targeting many of the neighborhoods where chemical attacks occurred. In the 24 hour period after the attack, we detected indications of artillery and rocket fire at a rate approximately four times higher than the ten preceding days. We know that, on the day after the attack Kerry called his Syrian counterpart, Walid al-Moualem, to urge him to let U.N. inspectors into the areas affected. Kerry mentioned this today as well. Here's the question, though: If Kerry had this line of diplomatic communication open, and there was intelligence coming in from Syria that there was something chemical afoot, why not pick up the phone before the attack? Why not wave the red lines and international norms in Syria's face before 3,600 people are exposed to sarin? And why not try to prevent it from even happening? Given that we also found out today that the White House is certain that chemical attacks with fewer casualties were carried out several times before the August 21 attack, this is an especially pressing question. Though, because those prior attacks were fairly small scale—"only" 100 or 150 victims at a time—and were more targeted—the August 21 attack hit twelve areas at once—perhaps the administration was not anticipating the massive and intensely dramatic disaster that then unfolded. This afternoon, on a background conference call with two senior administration officials, I got to ask that question. One of them said that "we have pursued diplomatic avenues." "When we saw particularly disturbing things," the official said, the U.S. engaged "various countries to send Assad a message." It's unclear if any of this back-channel diplomacy stopped any attacks, though that seems unlikely. Both officials spoke of Assad's "eagerness" to deploy chemical weapons. The other administration official, however, had a more banal and more humanly disappointing answer: not all intelligence streams are real time, and some have "a built-in time lag."